It was long, windy, loud and pretty much awesome. I was exhausted after spending more than fourteen hours on Norman's Main Street. The weather held up and did not rain yet it did give us plenty of wind (typical Oklahoma) and sunny skies by early afternoon; not one to complain over sunny skies but it was unexpected and caused many sunburns. After a fantastic turnout of 13,000 fans last year, this year's turnout was expected to exceed over 25,000; initial reports show that more than 20,000 fans turned out for this year's installment. The crowd was much more active, dancing around and singing with many of the artists. 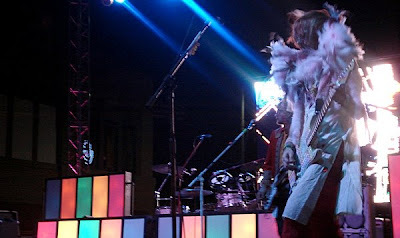 My only complaint was the douchebag and his girlfriend who made the early stages of of Montreal's set miserable; these two fuckers kept flailing around and elbowing people, almost causing fisticuffs to ensue. Fuckers. But for the most part, the entire festival was run smoothly despite its increased popularity and traffic flow. Excellent job Norman Arts Council. My highlights of the festival were Gentle Ghost on the Opolis Stage, Sugar and Gold and Man Man on the Main Stage; I know, I didn't include of Montreal but it was more than expected to see a spectacle from the Athens, GA rockers. Rather than describe each performance for you, I will embed a handful of some of the video I took. Not the greatest but not bad either.